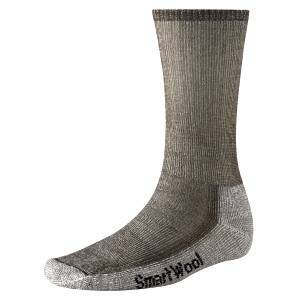 I bought the SmartWool Hiking Medium Crew when I bought my first pair of hiking boots. When I was at the store getting my boots, I went ahead and got these socks too, this way I could try on the boots with the socks I would be wearing the boots with, so that I knew that I would be getting the right size boots. I was immediately impressed with these socks. Even though I knew I needed 2 pair of socks, I would have bought another pair anyway after wearing the first pair. They are very form fitting without constricting. They offer a nice amount of warmth for using in temps down below freezing (for me). The medium weight thickness is thick enough to offer a good deal of comfort while still not demanding too much volume inside my boots. I have even wore these inside my tennis shoes comfortably. They do an excellent job at controlling moisture, which in turns controls odor. I would definitely recommend these socks to anyone. My full report can be read here.